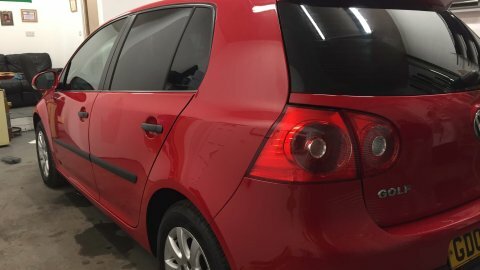 Red vw golf window tinting. 20% vinyl on the back and 50% front. We would like to inform all the individuals interested in changing the look of their car for better that now it is easier than it has ever been thanks to our company! Adi Window Tinting excels in changing ordinary, uninteresting cars into luxurious pieces of art. While placing an order for our services, you are entirely in charge. You can choose the transparency, dimensions, and color of a tinting layer applied on the windows of your car. We are more than sure that you will be astonished by our price-list as well. Contact us and let us discuss the details of our fruitful cooperation.